In 2017, the beer industry saw continued expansion in both real and virtual retail outlets, resulting in consumer purchases being divided between more outlets and occasions than ever before. At the same time, beer lost share of total alcohol to both wine and spirits, making the industry more fragmented and increasingly difficult to track using traditional measures. According to data from the Alcohol and Tobacco Tax and Trade Bureau (TTB), there are more than 50,000 permitted alcohol beverage operations in the United States. That number includes more than 20,000 permitted alcohol wholesalers; 8,600 permitted breweries; 12,500 permitted wineries; 2,400 liquor producers; and 10,000+ alcohol importers. In addition, the Nielsen Company’s TDLinx account tracker reports there are more than 640,000 alcohol beverage retailers across the country. These businesses serve more than 160 million legal drinking age (LDA) adults that “find an occasion” to consume alcohol beverages, according to the most recent Gallup polls. There is an impressive number of market players in an increasing complex marketplace. 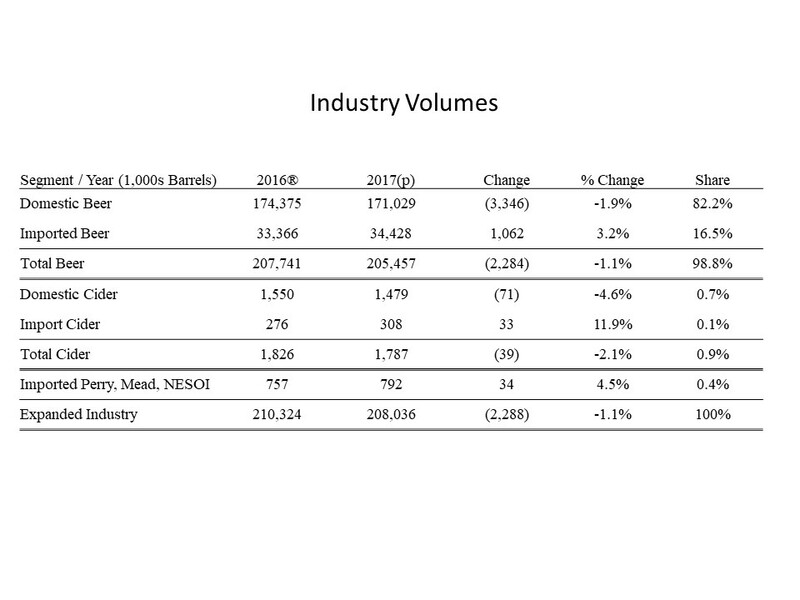 With a growing economy and so much more activity across the entire alcohol beverage industry, it’s a big surprise that industry volumes were down 1% in 2017. Preliminary data from the Department of Commerce and The TTB suggest that total case volume – including all domestic and imported malt beverages – fell by 2.3 million barrels or 31 million case-equivalents. But the story does not simply end with an accounting of beer. The data in the table below show domestic and imported malt beverages with additional volumes for cider, perry, mead, and a category called “NESOI” - an acronym for “Not Elsewhere Specified or Included.” NESOI beverages in this case are the fermented alcohol beverages that simply do not fit into a traditional category and are lumped together into an obscure import account reported out by the Department of Commerce. Yes, this category is a small share of total industry, but just like every other disruptive category to invade the beer space, it will grow faster than the balance of the industry and take up an increasing share of the industry. Note: this is just a glimpse of what is tracked among imported beverages through US Customs and Borders Protection. Domestically, the fragmentation is likely much greater and much more difficult to track, including everything from hard sodas, hard seltzers and products yet to be categorized. Fragmentation and the “Long Tail” in the industry continue to increase the value-added role that beer distributors play in the alcohol beverage marketplace and, more importantly, in the economy as a whole. The economic efficiency, logistical expertise and local marketplace knowledge of an independent distributor ensure that retailers and consumers continue to experience the widest-possible choice and value in their beer aisle. 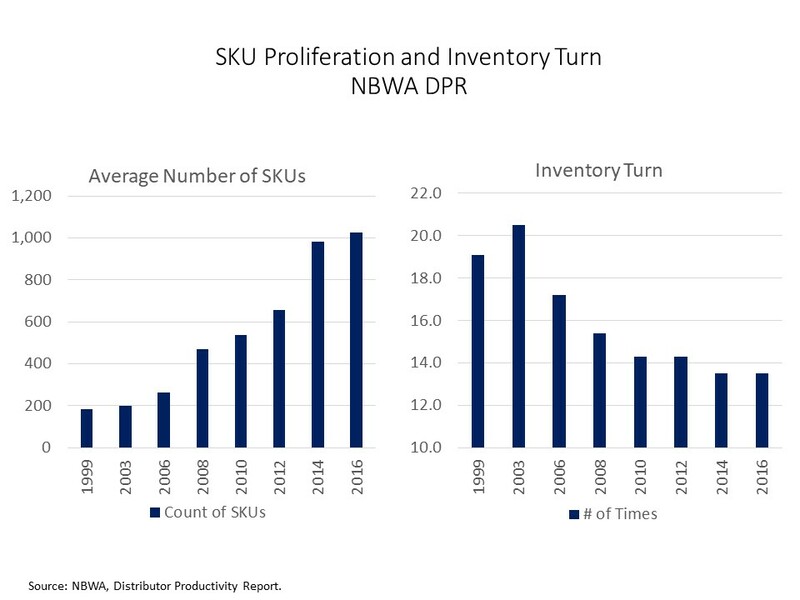 Recently released data from the 2016/2017 Distributor Productivity Report demonstrate, since 2006, that the average number of SKUs carried by distributors has increased fivefold, while the average inventory turns have fallen from 17 times per year to 13 times per year. Managing a broader array of products and significantly more retail accounts in a growing economy makes beer distributors’ work more complex and challenging. But distributors are best suited to rise to this challenge. Managing the expense of getting product from manufacturer to consumer will be a challenge in 2018. Inflationary pressures, driven by full employment and higher costs of moving product through the supply chain, are becoming more apparent every day. 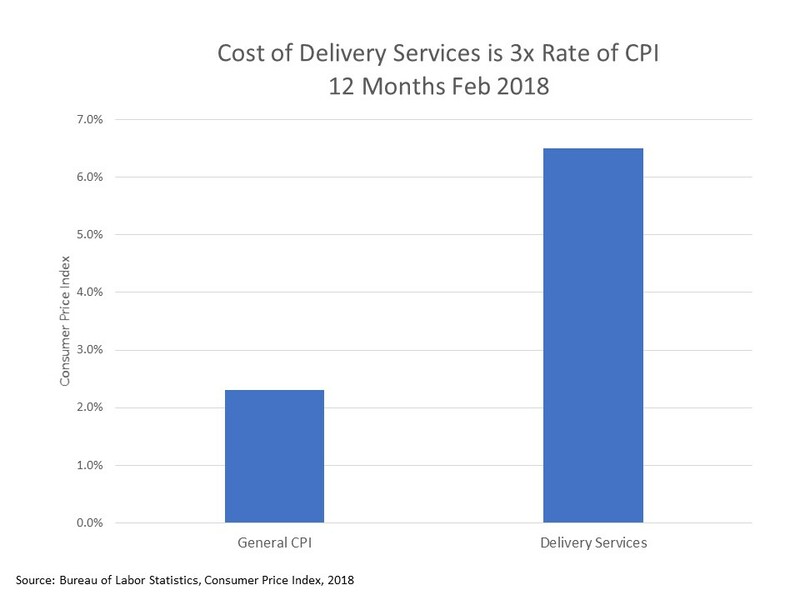 A quick look at the recent Consumer Price Index data shows “Delivery Services” inflation is growing three times the rate of general Consumer Price Index (CPI). Almost everything associated with moving a product through the supply chain will be more expensive in 2018 – that includes prices for cardboard, plastic packaging, labor, insurance and fuel. The latest news that Amazon will limit deliveries on lower-priced items and the recognition that consumers at Whole Foods stores are increasing use of “lockers” for self-pickup, are all fresh indications that there are no “free lunches” when it comes to distribution of any products. Beer distributors have a basic comparative advantage in logistics and distribution efficiency relative to the rest of the economy. In this inflationary environment, logistics and distribution efficiency will increasingly be at a premium as the economy continues to grow in 2018. Properly understanding where there are opportunities in this evolving economy may prove to be a challenge, but also presents an opportunity for distributors to succeed.